Mmm, bread, homemade bread. I just love the smell of homemade bread baking. I used to make bread in our bread maker at least 3 times a week. It was great having homemade bread on hand. But then my bread machine died. I thought about purchasing a new one right away. But I decided to give making bread by hand a try, after all, that’s how I used to make bread before I purchased the bread machine. I call this recipe a frugal recipe because it doesn’t take many ingredients and it’s inexpensive to make. It’s just $.44 a loaf. 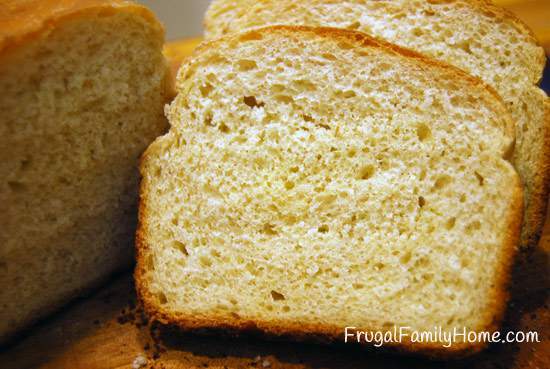 This recipe is fairly easy to make and I can make two loaves in the time it took my bread machine to make one. Making bread by hand does take a little more hands-on time but most of the time is waiting for the bread to rise. When I am baking bread I usually start the bread in the morning, mixing up the dough and adding it to the oven to rise. Then we do some of our homeschool lessons. After about an hour I come back and punch the dough down, shape it and place it in the loaf pans. After that small task, I have another half hour or so before I need to do anything again. Once the dough has risen enough in the loaf pans, I turn the oven on and the great aroma of baking bread starts in just a short amount of time. Yum! Make sure the water is warm and not hot. It should feel warm to the touch to be just right. Mix in as much flour as you can with a spoon and then mix as much as you can with your hands. The dough should be tacky but shouldn’t stick to your hands, if it’s too sticky add more flour. The amount of flour needed can change with the weather, more humid or wet weather, you will need more flour. To test to see if the loaf is done baking tap the top if it, if it sounds hallow it is done. This recipe is great since it doesn’t use any eggs. It also doesn’t call for milk so it’s dairy free too. If you prefer whole wheat you could try substituting half of the all-purpose flour for whole wheat and using brown sugar instead of white sugar in the recipe. Add the yeast to the warm water and stir to dissolve. In a large mixing bowl add the sugar, oil, salt and 2 cups of flour. Mix in the yeast mixture with the flour mixture. Gradually add in more of the flour to make a firm dough. Knead the dough on a floured surface for about 8-10 minutes, until the dough becomes elastic and smooth. Place the dough in <g class="gr_ gr_264 gr-alert gr_gramm Grammar multiReplace" id="264" data-gr-id="264">a oiled</g> bowl and let rise in a warm place for about an hour. Punch down the dough and shape into loaves. 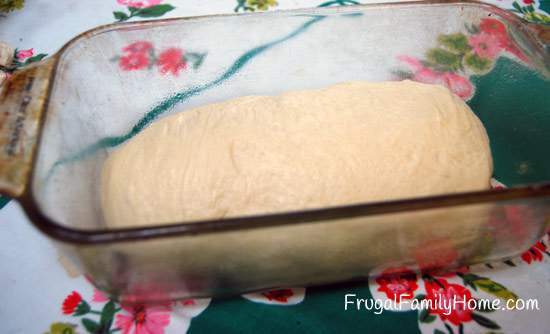 Place the dough in greased loaf pans. Let rise until double about 30 minutes. Bake at 350 degrees for about 30 to 35 minutes. Remove the bread from loaf pans and cool on a wire rack. Do you make your own bread? 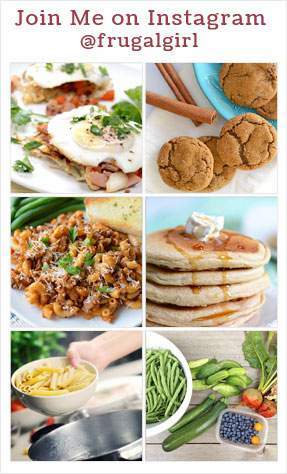 Find more frugal recipes here. Check out my homemade bread video tutorial to see all the steps in making this bread in a video. 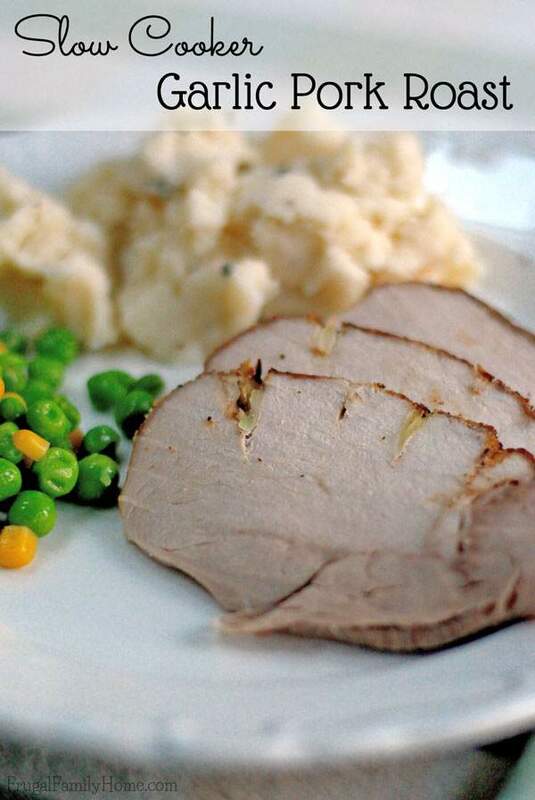 Thanks for sharing this recipe, Shelly. 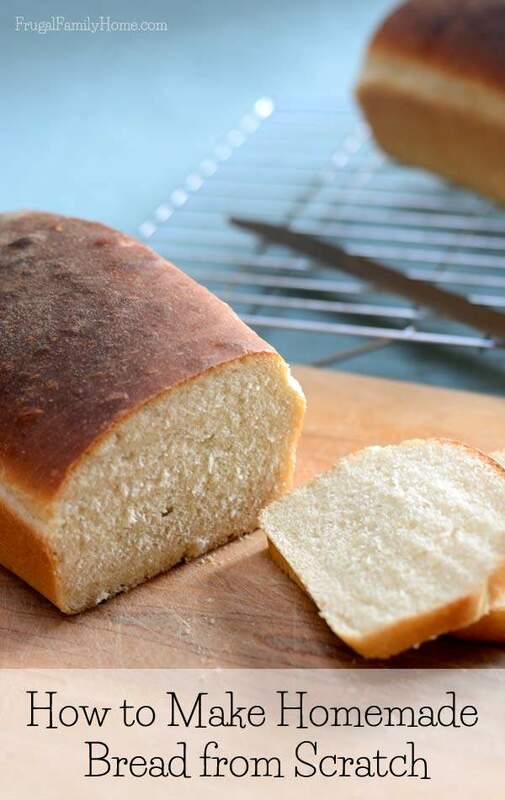 Homemade bread is just delicious. Thanks for the recipe, very tasty and moist!! I’m so glad you liked the recipe, Jennifer. 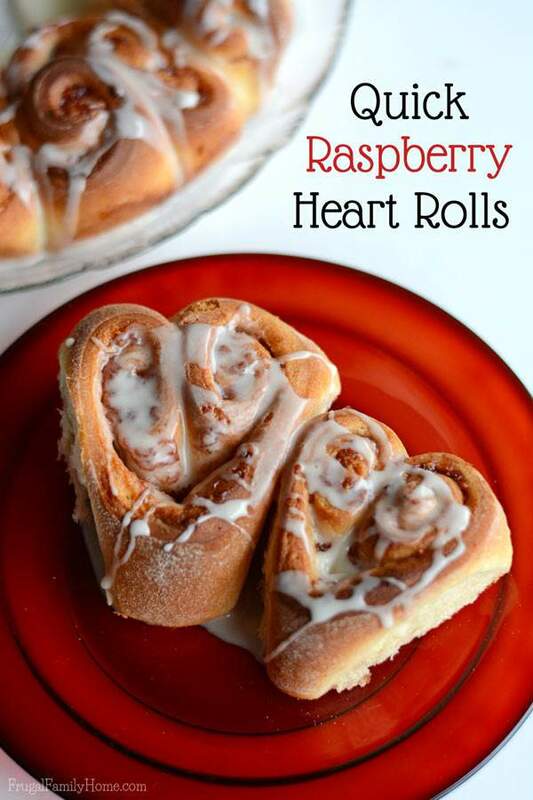 Love love love this recipe!! 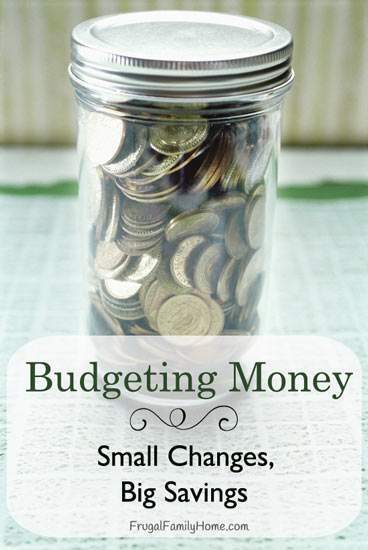 Very easy and affordable to make. Will try freezing a loaf next. Thank you so much. Faith, I’m so glad you liked the recipe. I always make 4 loaves at a time and freeze them for later. Be sure to fully cool the loaf before placing it in the bag to freeze. This made two loaves for you right? Thanks I saw the yield up above after posting. LOL! It made two great loaves of bread for me! Thanks. If I wanted to use this recipe in a bread machine, are the directions any different? Also you just say yeast, is it dry active yeast or instant dry yeast? Sorry I’m new to bread making! Place the ingredients in the order listed in your bread machine manual and it should work well. The first batch you might need a little more flour or a little more water. Just check the dough in the machine as it starts to mix to see if it’s too dry, too wet or just right. Hope this helps! Let me know if you have any more question. Happy Baking! Paulina, I don’t think the recipe will work without yeast. I’d wait until you have yeast and then give it a try. I’m afraid the bread would turn out hard and not rise well without yeast. Michelle, I’ve not tried it with other flours before. But if you have a flour or a flour combination that replaces wheat flour it should work. There might be a little difference in the texture though. I tried it with coconut flour and it worked great, do you have a good vegan no rise bread recipe? Breanna, I’m not sure what you mean by no rise bread. Do mean a quick bread recipe like banana bread? Did you use the same amount called for in the recipe of regular flour? Yes, the same amount of regular flour. I hope that helps. can I cut this in half as I only have one bread pan? Michelle, You can cut the recipe in half. But you might make the whole recipe. Then when it comes time to shape the bread dough into loaves. Place one in your pan and the other shaped loaf in the freezer. Wrap it in plastic or place in a freezer bag. Then when you are ready to make another loaf of bread just grab the frozen loaf and place it in the pan to thaw and rise. Once risen, bake as usual. Hope this helps! Hello! I am so excited to make this recipe! Can you tell me what kind of flour to use? All purpose, bread flour, etc? Thanks so much! Anna, I use all purpose flour, when I make this bread recipe. I hope your family enjoys it as much as we do. Whoops, I completely overlooked that in your recipe. Thanks for the response! I have never made any kind of bread before, so I was nervous to try. I have to say, I am so pleased with how easy this recipe was. It is also delicious! I plan to make a few batches today and freeze them for fresh bread later. I’m so glad your liked the recipe, Anna! Regarding making bread with what type of flour to use. I’ve made bread with all purpose or AP flour. Have used bread flour as well. The recipes I use usually require milk. Was thinking of purchasing a bread machine but don’t know which one to buy. Some of the reviews are very negative regarding bread machines. Caroline, I had a bread machine I loved it was a Welbuilt but I don’t think they make them anymore. I tried a different brand, can’t remember which one, it died pretty quickly and at that point I gave up on purchasing bread machines and started making bread by hand 4-5 loaves at a time. Thank you so much for the recipe. Quick question, do you use the ice cubes in the actual baking step too? Thanks again. Ghazal, I usually put the ice cubes in while rising. A few with the first rising and a few more during the second rising. Then when baking I don’t add more since there is usually some water left in the oven from the ice cubes melting. I hope that helps. Since I dont have an oven can this be steamed. Also Since its my first time to make bread I would like to try 1 loaf so can u please tell me how much flour etc. also can I make it with wheat flour. Tks. Since you will be using whole wheat flour be sure to knead the dough until it is smooth and satiny. About 10-15 minutes. As far as baking goes, I’m not sure if steaming would work. I’ve baked mine on our wood fired grilled before but I’ve never tried to steam it. Does this bread thaw well if frozen? I plan on keeping a few loaves in a deep freezer. Tami, It does thaw really well. I make up to 5 loaves at a time for the freezer and I’ve never had any trouble with thawing it. Hi there! How long does it take to thaw the frozen loaf? Do I thaw it on the counter or in the microwave? My son have just been diagnosed with dairy and egg allergies and I am so happy that I found your recipe! 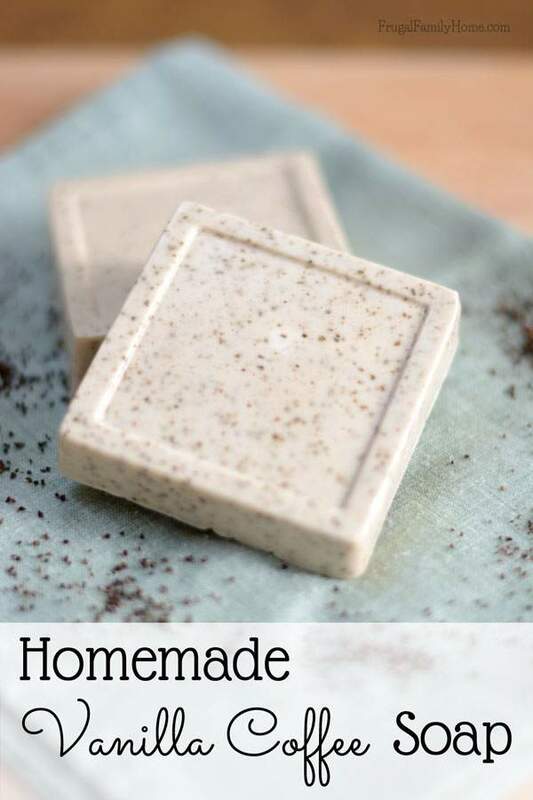 I’ve seen the video tutorial as well and can’t wait to try making it myself! It will be the very 1st time I’m trying to make my own bread so fingers crossed! Veronica, I usually take the loaf out of the freezer the night before and let it thaw in my cupboard overnight. But when I’ve forgotten to thaw a loaf, I will microwave it on half power for a minute or two until it’s thawed enough at the end to slice off a piece or two. But it works best to thaw overnight. I hope your first loaf turns out great! So I’ve tried making this yesterday night, and it was wonderful! It’s moist and soft and oh so good! I still can’t believe that I have made a bread with my own 2 hands! I do have a question though, the bread tastes yeasty to us. I used 1 tbsp of instant dry yeast. The instructions on the packet says that I shouldn’t dissolve it in water prior to using. Is that why the bread tastes yeasty? Can I substitute the yeast with baking soda or should I not dissolve the yeast like the instructions said? By the way, thank you thank you thank you for sharing this recipe and making the tutorial video! Cheers!! For the yeast, I use Dry Active Yeast. If you are using the Instant Yeast, you might want to try just one packet next time because I’m not sure if the instant yeast is more concentrated. I haven’t used it before. 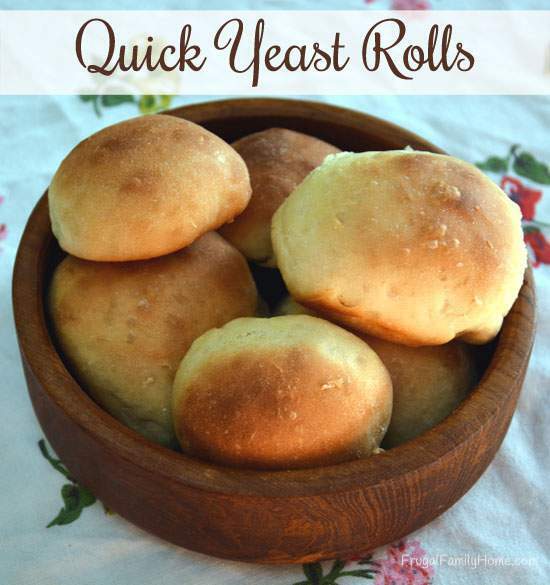 The next time you make the bread, try adding in 1 packet of yeast instead of a tablespoon of yeast. That should cut down on the yeast flavor. I would also add the instant yeast to the dry ingredients or as it says on the directions. For using baking soda, The recipe wouldn’t work with baking soda, I don’t think it would rise at all or not much, because the yeast is what makes the bread rise. So I would avoid using that. I hope this helps you. Let me know if you have any others question I can answer. I’m new to dairy free…experimenting to try and alleviate some nasty symptoms. Seems to be working…feel great. I guess that’s a mixed blessing, but I’m going to do more research on the whole thing as I go along. I’ve tried this recipe a few times. The first few times, it was fine. I wish it had more flavor, but I’m also used to more hearty, flavorful breads … my favorite is oatmeal. I can’t taste much yeast flavor, but it has come out good (almost) every time I’ve made it. The last time was a huge fail….2 large hockey pucks on the sideboard as I type. I think I killed my yeast. I knew better. Anyway, my question/comment: Does anybody ever make this and end up using all 7 cups of flour? I have never gotten even close….with the most being 5-1/2 cups. I use King Arthur Unbleached White. I know I use the full amount of flour most of the time, but the area I live in is humid. If it’s less humid, I’ll use less flour. I use unbleached white flour, but I’ve not used King Arthur before. I hope that helps. Could you tell me what size loaf pans you use and does it matter what kind of yeast? I have active dry on hand. I’ve been put on an elimination diet while breastfeeding. 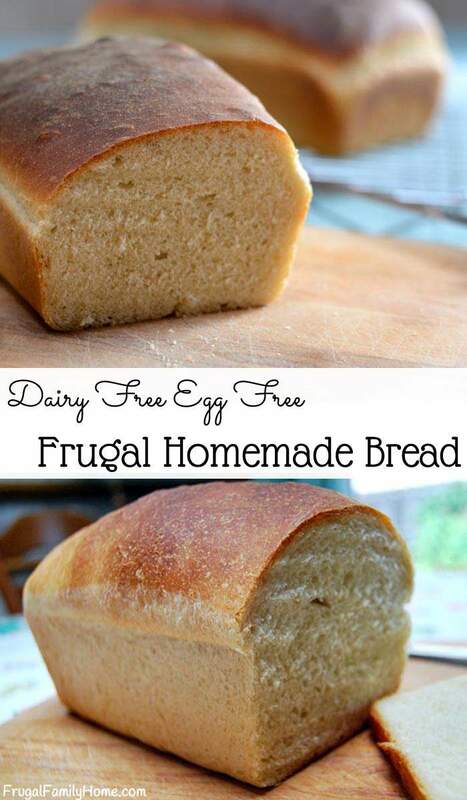 I’m having a hard time finding any bread that is soy, milk, and dairy free so I’m anxious to try this recipe. The yeast you have on hand is the same I use, active dry yeast. For the pans, I use my 8.5 by 4.5 loaf pans. I know it can be hard to find bread that is soy, milk and dairy free. Most store bought bread contain at least one of those ingredients. Let me know if you have any more questions. 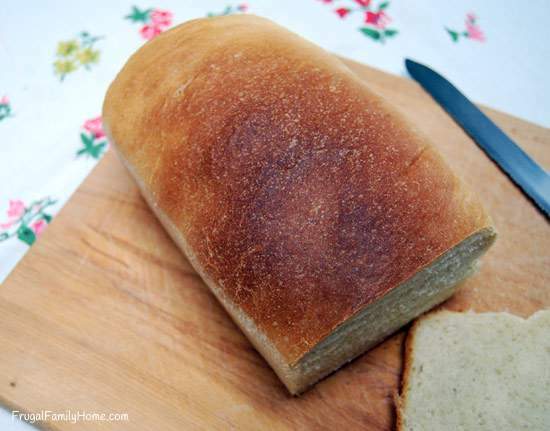 I am in hot Jamaica and my husband and I made homemade bread a few days ago for the first time using this recipe. It was deeeelicious. I still can’t believe how easy it was to do and how soft and lovely it came out. Wish I could show you the pics. So guess what??? I am about to make some more. Can hardly wait. Sherron, you just made my day! 🙂 I love to hear that what I share is really helping other people. Thanks for taking the time to let me know. I am a first timer without a bread machine. I made this and it turned out like bricks! Oh no! What did I do wrong? I, too, couldn’t add all the flour…I tried though. Did I make it too dry? Bethany, It might have been too much flour or the yeast might not have been good. How hot was your water? Just warm to the touch or really warm that you added the yeast to? If the water was too hot, the yeast might have been killed which would make for a heavy brick like bread. Did you dough rise alright for you? When kneading the dough was the dough flaky and dry? If it was too dry that could be the problem too. I’m sorry this didn’t turn out for you did you watch the video tutorial? The water was just warm, but I went back and looked at the package and it said “best if used by January 2015”. When I was kneading the dough it was very dry and flakey. I knew I was adding too much flour because it wasn’t tacky. I was forcing the flour in (I’m not sure why I thought that would work). I’m definitely going to try it again because I know it will be good once I get it right. I didn’t watch the tutorial! I over looked that. Thank you for pointing it out! Also, I have a bread hook on my mixer, would that work for the kneading or is it best to do by hand? It sounds like the bread dough was too dry. I’m not sure if the yeast was a problem or not, but I would get some new yeast before trying the recipe again. You want to make sure the yeast foams up a bit so you know it’s good. I hope the video will help you be able to see what it should look like. If you have any other questions don’t hesitate to ask. You could use a bread hook on your mixer to knead the dough. I also have a mixer and use it to mix up bread dough, but I wanted to make sure to show how to make bread without one, just in case someone didn’t own a mixer. Hi, Shelly ….. I am becoming a vegan, using NO oils, butter at all. Is there a way for me to make this bread using NO oils? Thanks so much. I hope there is. I’m new to veganism and I’m trying to find recipes I really like. What kind of yeast dry active ? Angela, Yes I use the dry active yeast. Would I be able to use the dough hook on my kitchen aid for this recipe? Would it change the recipe at all? Thank you for the recipe! I’m making it now & cant wait to see how it turns out! There are a couple differences between the video and recipe so I’m wondering which to do…the video said punch back down a second time and then put in load pans (a third time I think) to rise but recipe says 2 x..,does it matter much one way or the other? Also I think the video says 425 but recipe says 350 do just wanted to be sure on oven temp. Thank you sooooooo much!! Your Welcome T! Sorry for the confusion. You can let it rise 2x before shaping loaves or 1x. If I have time I let it rise twice, but if you only have time for 1 rising before shaping the loaves it will be fine. You can bake at either 350 for 30-35 minutes or at 425 for about 20 minutes. I’ve baked this bread at both temperatures. I hope your bread turns out wonderfully. I only have 3/4 Tablespoon of yeast. Do you think that would make a huge difference? Whitney, I don’t think that would make a huge difference. It should be fine. I was wondering if honey could be used in place of the sugar. I will also be trying a gluten free flour, as my daughter shows signs of ADHD and we know that soy, wheat and dairy are triggers for the unwanted behavior. Terri, I’m sure you could use honey instead of the sugar without any problems. Question, how does it get brown on top? Nada, as it baked the top turns brown in color. Hi! My loaves are in the oven right now! You used glass pans right? That’s what the pic showed. If not, is there a temp change? Cassie, I hope your loaves turned out great. Yes, I use glass pans or a mix of glass pans and metal depending on how many loaves I’m making at one time. They turned out great thanks!! My hubby was super excited! I ended up using less flour cause it felt like it was getting dry unless I counted wrong… which is entirely possible with a toddler to handle at the same time lol! I’m so glad the bread turned out so well for you. Great job Cassie! Listen to me… I followed the recipe and this is the best bread I’ve ever made for my husband in the two years that we have been married. I have tried several recipes with butter and milk and it always comes out like a rock (although my husband eats it no matter how it tastes or looks). The yeast tip is new to me and it is a keeper. Thank you. Alicia, So glad you liked the recipe. Thanks for letting me know. I cant wait to make this bread! Im a virgin bread maker in colorful Colorado! Yes, to make it in a bread machine you would cut the measurements in half and place the ingredients in the order your bread machine recommends. I hope you enjoy the recipe. 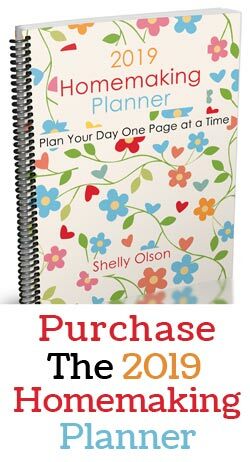 Hi Shelley and thanks for the recipe. I, too am a homeschool teacher as well as a vegetarian. It is a relief to find a way to make bread without animal products in it. Thanks again! I don’t know why that person named Chuck would want to make bread without oil. That has nothing to do with being vegetarian. Regardless we appreciate your help. I am about to start making the bread now. Gotta go! Take care. Your welcome Laila. I hope your bread turned out great. Hi! I’m new to bread making. Is it ok to use gluten free flour on this?… I will be using a bread machine. Angel, I’m not sure I haven’t tried it before. I’m thinking the texture might be different, but I really don’t know. If you try it please let me know how the bread comes out with the gluten-free flour. I would love to know! Thank you so much for sharing this receipe! We’ve been snowed in for the last few days and have run out of milk, but this recipe worked so well using our store cupboard supplies. Very much appreciated! So glad this bread recipe was helpful for you Sally. I hope you can get out and about soon. I just tried making this with coconut flour. Complete disaster. The mix never thickened enough to even knead. It was flaky and broke apart. No dough whatsoever. What did i do wrong?!? Heather, I haven’t tried making bread with coconut flour. But I think because it doesn’t contain gluten you can’t use it in a standard yeast bread recipe. But would need to use it in a bread recipe that is more like a quick bread with eggs and baking powder. I think your bread didn’t turn out because the coconut flour was too different from the wheat flour. You might try a recipe like this one with the coconut flour instead, it’s dairy free but does use eggs. Hi, been baking GF for daughter for about 5 years. None of the GF flours can be used alone such as coconut. They always call for a mixture. There are a lot of GF all purpose flours out on the market at this time. King Arthur has the best one called Cup for Cup but I can’t find it around our area. Small town with a 3 hour drive to a big one. But friends have raved. Lots of GF blogs and have had some really good results and of course some not so great. Daughter finally had a massive allergy testing done and she has egg, dairy, pork, etc. which ends with 53 allergies. So that how I found your blog looking for a dairy, egg free bread. Margi, Thanks for sharing your advice about the GF flours. I’m sorry to hear your daughter has so many allergies. I hope since you now know what she is allergic too things can improve for her. Just made a loaf and six rolls (as I only have the one bread pan) substituting 4 cups of the flour with bread flour (didn’t have enough all purpose) using brown sugar (all i had) and 1 1/4 tablesoopns of dry active yeast (all I had, super broke lol) and it all came out quite lovely. It may also be worth mentioning that I used extra virgin olive oil. This is my first loaf of sandwich bread, and I love it! Thanks so much for the recipe! So glad you liked the recipe, Makayla! Bread. I found your recipe. I can’t wait to make it. Thank you for sharing. Your welcome Roxanna, I hope you enjoy it. Hi! 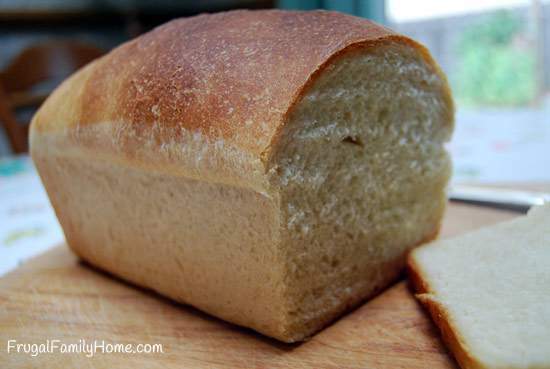 Do you keep the loaf whole or slice it for storage? Thanks! Jackie, I usually keep it as a whole loaf and cut or slice it as needed. Hello. Thank you for the recipe. I noticed others mentioned in comments about a video for this recipe. Can you provide link? I’m unable to find it. Mary, I need to make the link easier to find in the article, sorry about that here’s the link to the video for this recipe. Is the sugar a must? Diabetic and low sodium diets to account for. Can i substitute Stevia? Dee, I think you could leave the sugar out of the recipe. I’ve not used Stevia in baking but I don’t see why it wouldn’t work. I hope the recipe turns out well for you. 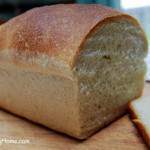 I came across this recipe when I was on a low iodine diet and could not eat store bought bread. It was so good!!! So much better than commercially made bread. Plus, it uses simple ingredients, not all the additives that are typically found in commercially made bread. I used coconut sugar this time ( I was out of regular sugar), and I used melted ghee for the oil. Still turned out yummy! Alecia, so glad you liked the recipe and good to know that coconut sugar and ghee works well too. Thanks for sharing. Help please! I made this twice for my son who had milk and egg allergy. He likes the flavor but cant even bite it as it came out rock hard. It’s also doughy in the center. First time dough was sticky. Second time we heated up the yeast more and dough was good tacky consistency but still came out the same. Any advice would be appreciated! Alyson, Have you seen the video I made for this recipe? Here’s the link, it might be helpful. When you say the bread came out rock hard, did it not rise well? I didn’t realize there was a link! Also reread all the comments. I overdid the flour and after taking in the advice, it’s come out soft! Only concern is that the bottom of the load seemed more doughy. I am able to bake it longer to get rid of the doughiness but then the top gets a charred. Do you have any recommendations? Thank you in advance! Alyson, you might try turning the temperature of the oven down and baking for a longer amount of time. Or move the bread to a lower position in the oven. Sometimes it helps to bake on a lower rack or in the middle of the oven so the bottom can cook at the same rate as the top of the loaf, just a few inches can make a difference in some ovens. I hope those tips help.